Finding the right paddle for you isn’t about what Bob or Sally plays with or which colors look best. It’s about building the right tool for the job. Players that understand their game and are educated in the playing characteristics of the materials that make their paddle and cause it to play a certain way, are better equipped to perform to the best of their abilities. Knowing about cores, surfaces, weights and handles/grips will enable you to build the paddle that will elevate your game. When you have confidence in your equipment, that translates into performance on the court! Currently, we offer three different types of cores: Aluminum, Nomex and Polymer. Each one has playing characteristics that suit certain styles of play. 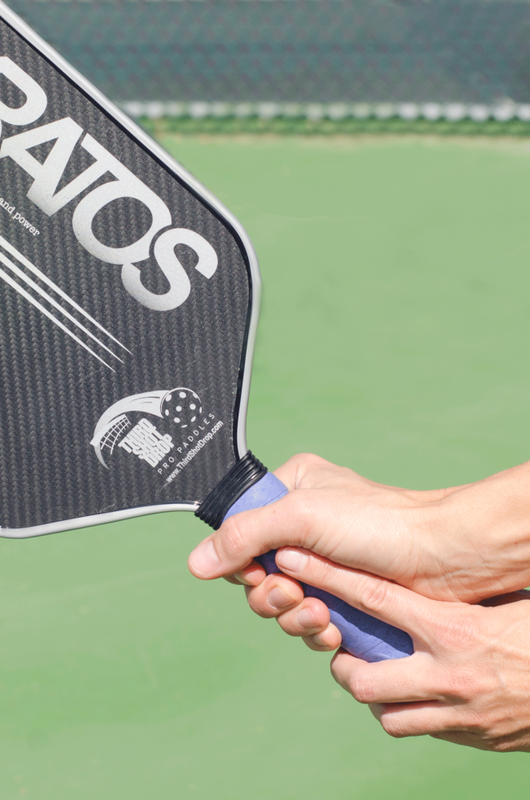 Aluminum core paddles feature advanced, lighter weight, aluminum honeycomb cores. Aluminum cores are known for their outstanding “TOUCH”. The ball comes off just a bit slower, which gives players an extra edge of maneuverability and control. This extra amount of control is due to both the soft rebound and the lightweight nature of aluminum. Players may prefer this core for their third shot drops and touch shots. However, aluminum cores do dent over time (more so with the “rubbery balls”), so are not recommended for super hard hitters. You will lose a bit of power with aluminum cores. 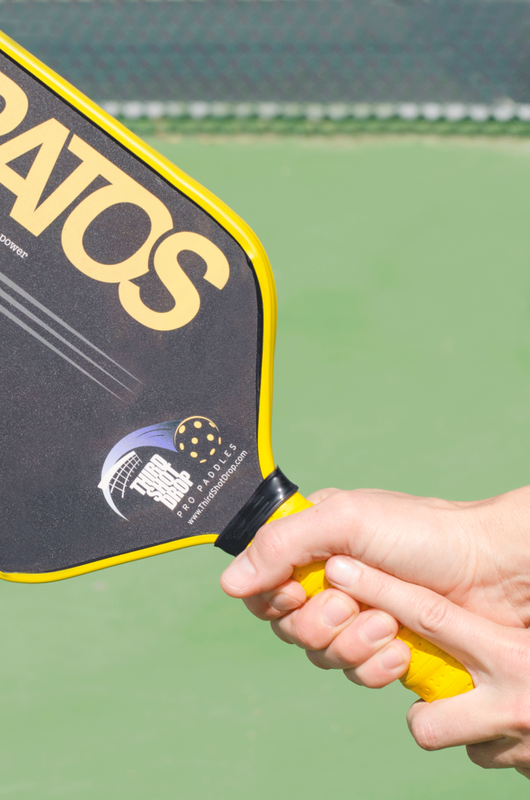 Polymer core paddles are the most popular core currently used in pickleball paddles. The honeycomb polymer core provides power performance, yet gives soft control for the touch shots. Polymer cores have earned the reputation of being the quietest core on the market due to being slightly less deflective than the other two cores. The reduced deflection offers players a split-second longer to manipulate the ball, hence offering control. Nomex core paddles feature a lightweight Nomex honeycomb core that has been used in a variety of sporting and high-tech industry applications. Nomex was the first core used in pickleball paddles and is still is a popular core material. Nomex honeycomb begins as a cardboard-like material which is then dipped in resin creating an extremely damage-resistant material. They are also the loudest of the three cores. Nomex cores are well-liked for their durability and consistency. Players looking for a lot of “POWER” prefer Nomex cores. You may lose a bit of pace control due to how quickly balls come (pop) off the Nomex core. 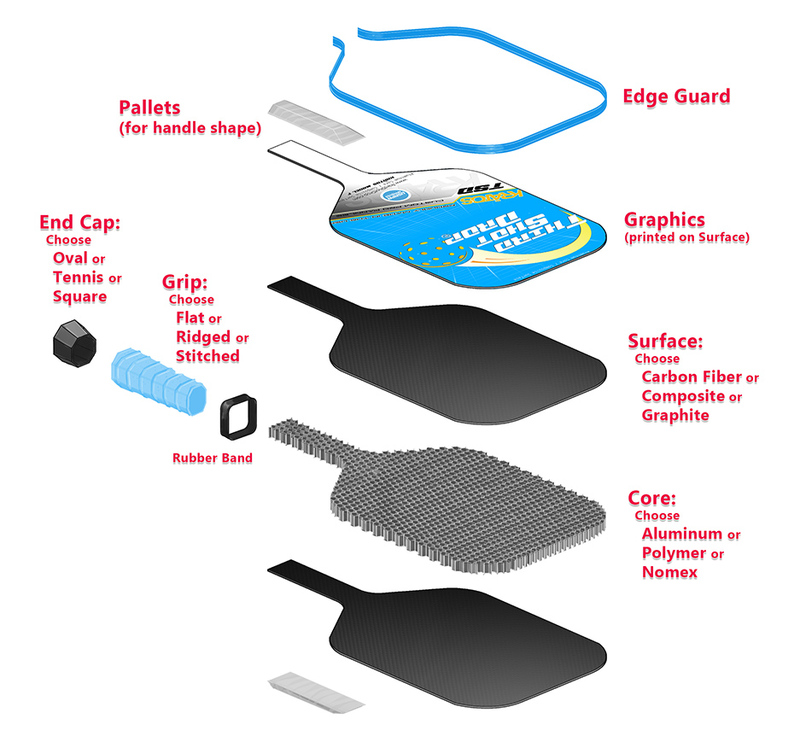 The three most commonly used surfaces for pickleball paddles are Carbon Fiber Weave, Graphite and Fiberglass Composite. Each has characteristics that, when combined with a core material, give each paddle the performance profile that suits every player’s unique style and game. Carbon fiber surfaces are the most expensive, most durable and lightest weight. When bonded properly to a honeycomb core, Carbon Fiber weave (it is actually fabric before being bonded to a honeycomb core) is strong, durable, high tech and very distinctive in appearance. It provides the ultimate in ball control, but can lose a bit of power compared to the other surfaces. Graphite paddle surfaces are very thin, about the thickness of a fingernail. Light and responsive, yet hard and strong. Players like the quick action off the Graphite face. Graphite is a bit heavier than carbon fiber and slightly less durable (and more cost effective, which is a reason many manufacturers use it rather than carbon fiber). Because of Graphite’s stiff nature, the ball does not sink into it, so it is easier to direct the ball, providing fantastic ball placement. Composite paddle faces take full advantage of the latest aerospace composite material technology. Variations of composite surfaces are expanding throughout the industry, increasing their playability. These paddles feature an incredible combination of touch, feel, and strength. The Composite surface provides a bit more power than the other two surfaces. Paddle weight is a hot button for players. Many believe that the weight determines how well they respond to the ball and should be based on their size and gender. That’s the opposite of what they need to think. Skill determines how well a player responds to the ball. Weight is more about what your body can cope with during play. Very similar to baseball bats and tennis rackets, the player must first have the skill to aim, respond and direct the ball. The weight is what lets them do it comfortably and accurately. Heavier paddles help smooth out players’ shots, making them more consistent and repeatable. Lighter paddles can encourage too much herky-jerky movement and inconsistent hits. Simple physics, Force = Mass x Acceleration, dictates that the heavier the paddle, the more power a player has with less effort. The paddle is doing the work. Players with light paddles tend to incur more wrist, elbow and shoulder injuries. Before a player decides that they must have a certain weight based on their size or gender, they should instead be sure that: 1) their grip is properly sized, and 2) the paddle weight matches their level of strength, regardless of their stature or gender. That combination is the most important factor in choosing a proper weight. Also keep in mind how the weight is distributed in a paddle. The key is how a paddle is balanced, not the total weight of the paddle itself. Mitigating the scale weight so the swing weight of the paddle feels light and responsive is what separates Third Shot Drop Custom Pickleball Paddles from the rest. You can pick up two paddles with the same weight and one may feel significantly heavier due to how the paddle weight is balanced. Blind studies have shown players typically think many of our paddles weigh an ounce or more less than their scale weight. Improper sizing will not only restrict your game, it can cause physical problems as well. Using a paddle with an undersized grip causes you to use more force to squeeze the handle. This can affect your hand, forearm, and elbow, leading to fatigue and eventually tendonitis. It also restricts the fluid motion so important in the soft game. Using a paddle with an oversized grip restricts your wrist’s motions, makes changing grips harder, and requires more strength to use. What handle shape do you want. Oval handles can be as small as 4”, while octagonal (tennis) and square handles begin at 4 3/8”. Grip tape style. We will grip your handle to the exact size you ask. However, if you plan to add your own over-grip, it can add 1/16” – 1/8” to your handle size. Be sure to deduct that amount when ordering your paddle, so your final grip size is correct. We offer flat, ridged, or stitched grip tapes. The grip size is the circumference of the handle at the midpoint. It’s measured in 1/8” increments. This measurement is the finished size of the handle, including any over-grip that may be added to the factory finish. If your measurement is between sizes, step down one size and add an over grip to increase it to the proper size. Hold your paddle in your non-hitting hand. You should be able to fit the index finger of your other hand in the space between your ring finger and palm. If there is space between your finger and palm, the grip is too big. If there isn't enough room for your index finger, the grip is too small. This can be a very overwhelming process for many players who are new to the idea of CUSTOM versus “off-the-shelf”. Some players may decide which model to use based upon reading the CORE and SURFACE descriptions on our Product Tri-Folds, while other players may need to actually try them out to see what FEELS RIGHT. It is very important that players first choose their model (CORE and SURFACE). Take away all other variables. 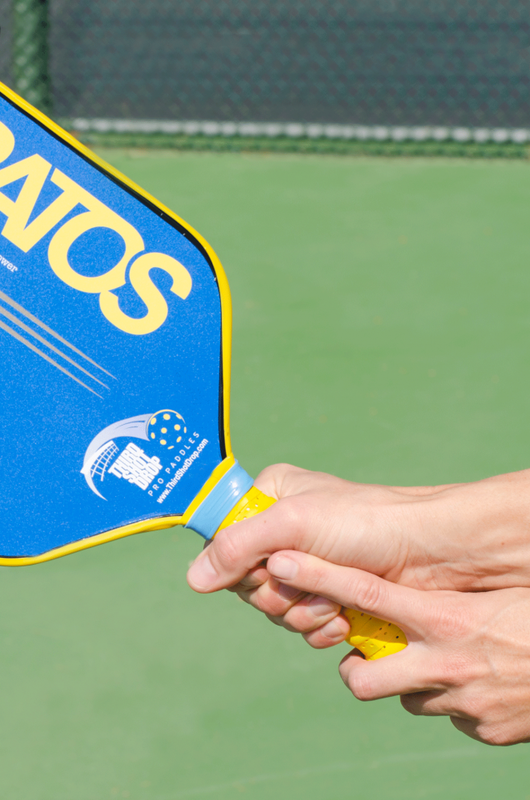 We recommend you give them 3 paddles all at the same weight (so that WEIGHT does not influence their decision). Ask if they prefer light or heavy. If they have no preference, begin with weight range-3. Begin with the 3 different CORES, but all with the same SURFACE. (Perhaps a surface that they already use). Have them go hit a ball with them. Through “process of elimination”, the player will then choose which of the 3 CORES feels the best. Next, choose 3 paddles with the CORE chosen in STEP 1, but with the 3 different SURFACES. Have them go hit balls with them again. Hopefully by now they have found the MAGIC and have chosen their TSD Model (A-I). 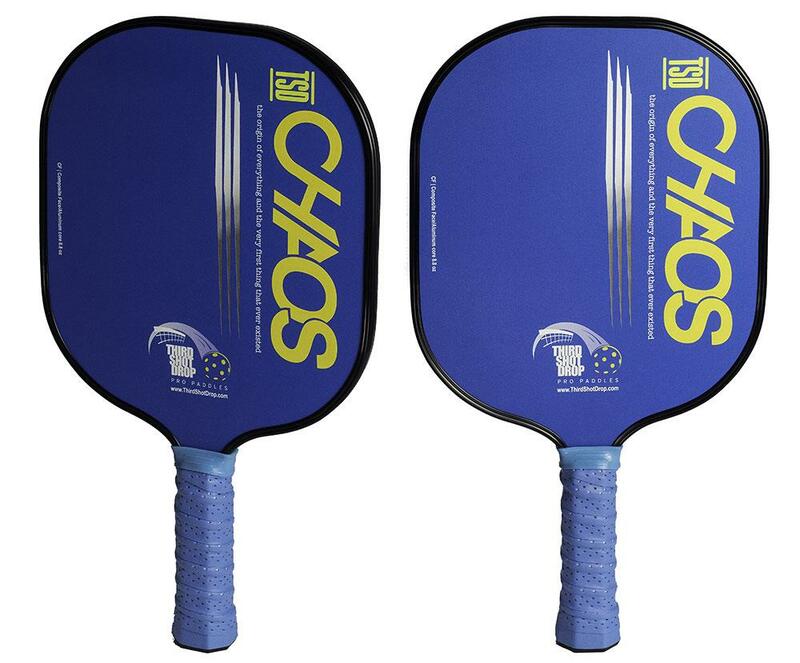 The player may have already chosen their preferred shape (CHAOS or KRATOS) and preferred weight prior to STEP 1, but at this time you can see if the player has interest in trying their chosen TSD Model in another shape (CHAOS or KRATOS) or perhaps in another weight range. Once again, have them go hit balls with those options to see what feels best. Next, you can help the player choose their handle shape/size (using the sizing charts and photo examples). The oval handle can be sized from 4”-5”; the tennis (octagonal) handle can be sized from 4 3/8”-6”; the rounded square can be sized from 4 3/8”-6”. Then the player can select grip tape. We offer 3 grip tape styles: flat, ridged, and stitched. Now the FUN STUFF happens, and they can choose COLORS: paddle face color, grip color, and edge trim color. And don’t forget, they can even put a CUSTOM graphic on the paddle surface as well!! TSD also offers a consultation with our graphic designer to help design a custom graphic for their paddle face. Write down all paddle customizations on the back of your Third Shot Drop business card to give to the player and fill out the TSD Paddle Order Sheet completely. 04-01-2019 Do you practice (rec) like you play (tourney)? 03-18-2019 Is practicing (drilling) part of your tournament preparation? 03-11-2019 PAT’S PICKLOSOPHY TIP #4 "THE DIFFERENCE BETWEEN WINNERS AND “OTHERS” IS IN HOW YOU PREPARE FOR YOUR MATCH"